Be it roasted pears against a sautéed foie gras or a smoked salmon and orange-tarragon gravlax carving station with traditional accoutrements and house-made créme fraîche or simply home-made marshmallow creations like the peeps we all knew as children, Easter brunch is always one to celebrate. Check out our Easter Brunch menus in Special Events - from Vegas to NYC we’ve got you covered. 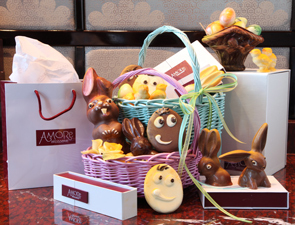 Or if it is simply Easter candy you’d like check out the special creations at Amore Patisserie in Vegas’ CityCenter or FC Chocolate Bar on Madison Avenue in NYC! Happy Easter Everyone! 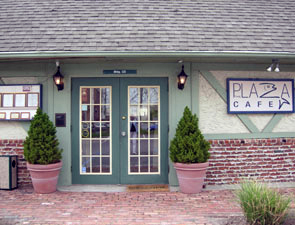 On Wednesday, March 31st, the Plaza Cafe is conducting a one time, only, cooking class to benefit The American Cancer Society. The focus of the class will be how to create great seafood appetizers to serve at your next social gathering. The price for the class is just $60 and all the profits go to ACS…and all the appetizers go to the participants. The event is being sponsored by our local Relay for Life chapter and reservations must be made through them. This promises to be a fun evening and it benefits a great cause! Champagne, frozen grapes, fresh fruit, chilled towels, poolside cabana massages by Canyon Ranch SpaClub, cuisine from celebrity chef Wolfgang Puck, Evian® water mistings and sunscreen application. The Palazzo Las Vegas brings the opulence of the French Riviera to the Las Vegas Strip with AZURE. Embodying sophistication at its finest, AZURE is for the guest who enjoys the finer things in life. AZURE is open from 11 a.m. to 6 p.m., Friday through Sunday for guests 21 and over. Contemporary and stylish décor with lush greenery, plush daybeds and lounge chairs, private cabanas, seasonal floral and serenity with Strip views drenched in fun surrounds guests as they listen to the melodic sounds of AZURE’s live DJs. 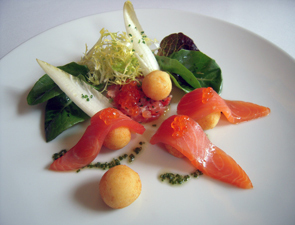 Culinary offerings at AZURE are just as exclusive with appetizing fare from celebrity chef Wolfgang Puck. Chilled Lobster Salad with Gazpacho Sauce and Avocado; Cured Organic Salmon with Spring Vegetables, Citrus Segments and Olive Oil; and Crisp Flatbread Pizza with Mozzarella di Bufala, Tomato and garnished with Basil are just a sampling of the many options available on the menu. In addition to the fine cuisine, guests can pair their poolside cuisine with wines or champagne-by-the-glass. Magnum bottle service consisting of Dom Perignon, Perrier Jouet Fleur, and Veuve Clicquot will also be available. New to AZURE, guests can enjoy brunch poolside on Sundays served from 11 a.m. to 4 p.m. with signature items from Wolfgang Puck including his Lobster Club Sandwich with Apple Wood Smoked Bacon, Nine Grain Toast and Kettle Chips; Grilled Prime Hamburger with Vermont White Cheddar, Onion Marmalade and French Fries; or French Style Omelette with Wild Mushrooms, Asparagus, Gruyere Cheese and Country Potatoes. Try the two-course brunch for two with a bottle of champagne over ice for $200. Adding to the fine line-up of amenities, Canyon Ranch SpaClub brings a mini-spa to AZURE with poolside cabana massages including the AZURE signature “Champagne on the Rock” massage. Combining cold stone placement, cooling menthol foot mask and a massage with antioxidant rich Champagne body oil that will help protect the skin from sun damage the “Champagne on the Rock” massage is a “must do” to complete the AZURE experience. AZURE is open from 11:00 a.m. - 6:00 p.m., Friday through Sunday for guests 21 and over. 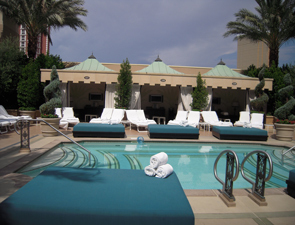 Please visit www.azurelasvegas.com or call 702-607-1218 for additional information and to make reservations for cabanas, daybeds, lounge chairs and bottle service. WHAT: Origin India Restaurant and Bar has partnered with BMC Fine Spirits to present an incredible night of food and beer on Thursday, April 15th. The dinner will feature five specialty import beers from BMC Fine Spirits paired perfectly with bold cuisine prepared by Origin India’s Executive Chef Kuldeep Singh. 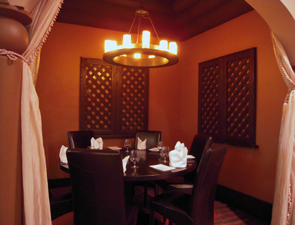 WHERE: Origin India Restaurant and Bar, located at 4480 Paradise Rd. (across from the Hard Rock Hotel & Casino) in Las Vegas, NV. WHEN/COST: Thursday, April 15, 2010 - dinner will be seated promptly at 7pm. As this is a limited seating engagement, reservations are strongly encouraged and can be made by calling (702) 734-6342. Dinner price is $55 per person plus tax and gratuity. Please reference “Beer Dinner” when booking your reservation. Travertine Supports Earth Hour - Special Cocktails Too! WHAT: Travertine will support Earth Hour by turning out the lights, and on Saturday March 27th from 6pm - 2am. By candellight, they will have Acoustic tribal Drums from 6pm - 10.30pm, and then integrate with music by Peter Makebish from 10.30pm - 2am. In-house Mixoligist, Courtney Bae has created a new cocktail, the ‘Earth Angel’, using organic crop vodka naturally infused with organic, fresh squeezed ruby red grapefruits and St. Germain Elder Flower liquor. Travertine is donating all sales of Signature Cocktail “Earth Angel” to OPS, Oceanic Preservation Society…www.opsociety.org. Travertine will also feature beautiful new Late Night dishes from Executive Chef Manuel Trevino using seasonal, local produce. WHEN: Saturday March 27th from 6pm - 2am. POPULAR SITINGS: Jay Z and Beyonce have been in for dinner, as has Tyra Banks, and Molly Sims, Kelsey Grammer and Kelly Bensimon are all regulars. With the opening of Kenmare in late march and the NOLITAN hotel across the street from Travertine in early June, people are already buzzing around the new “hot row” that is Kenmare between the Bowery and Lafayette. Spring is just around the corner, and sake fans all over Japan are rejoicing at the release of this year’s Arabashiri. Bottled young and released early, these seasonal sakes have vivid flavor, exuberant freshness and a clear, refreshing finish. 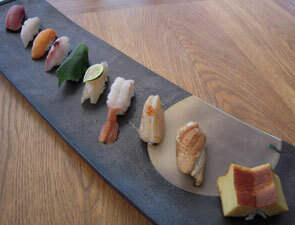 Masumi’s new Arabashiri makes its 2010 U.S. debut on March 24 at En Japanese Brasserie. Along with the new Arabashiri, we will be serving generous pours of five other junmai, ginjo, and aiginjo labels from Masumi as well as a generous spread of delicious bites. Restauranteur: Richard Melman, Lettuce Entertain You Enterprises, Chicago (Everest and Ben Pao). Outstanding Chef: Tom Colicchio, Craft, NYC; Jean Joho, Everest, Chicago; Charles Phan, The Slanted Door, San Francisco; Julian Serrano, Picasso at Bellagio, Las Vegas. Outstanding Restaurant: Mélisse, Santa Monica, CA. Rising Star Chef of the Year: Vanessa Garcia, Restaurant Charlie at the Palazzo, Las Vegas; Grégory Pugin, Veritas, NYC. Outstanding Pastry Chef: Kamel Guechida, Joël Robuchon at MGM Grand Hotel & Casino, Las Vegas. Outstanding Wine Service: Picasso at Bellagio, Las Vegas. Outstanding Wine and Spirits Professional: Alpana Singh, Lettuce Entertain You Enterprises, Chicago (Everest and Ben Pao). Outstanding Service: Joël Robuchon at MGM Grand Hotel & Casino, Las Vegas; Nobhill Tavern at MGM Grand Hotel & Casino, Las Vegas. Best Chef New York City: Daniel Humm, Eleven Madison Park; George Mendes, Aldea. Best Chef Pacific: Josiah Citrin, Mélisse, Santa Monica, CA. Best Chef South: Dean James Max, 3030 Ocean at Marriott Harbor Beach Resort & Spa, Fort Lauderdale, FL. Best Chef Southwest: Claude Le Tohic, Joël Robuchon at MGM Grand Hotel & Casino, Las Vegas. Room, and Rasika, Washington, D.C.
José Andrés, Minibar, Washington, D.C.
J & G Steakhouse, Washington, D.C.
Amanda Cook, CityZen at Mandarin Oriental, Washington, D.C.
Derek Brown, The Passenger, Washington, D.C.
Tony Conte, The Oval Room, Washington, D.C.
Peter Pastan, Obelisk, Washington, D.C.
Caviar, Copenhagen and the Land of the Czars! Experience the ultimate in luxury with a cruise aboard the Silversea Whisper from Copenhagen to St. Petersburg…Silversea’s cuisine is a celebration not just of hospitality, service, convivial friends and the luxury of open-seating dining, it is unquestionably the fine art of flavour. Menu items are carefully chosen to complement one another effortlessly and feature the gentle touch of Relais & Châteaux, Silversea’s partner. Join Master Chef Per Jacobsen, born and raised in Copenhagen, on this exclusive cruise from Copenhagen to Tallinn, St. Petersburg, Helsinki ultimately disembarking in Stockholm. Having graduated from the Hotel and Restaurant School in Copenhagen, Jacobsen specializes in fresh seafood from cold waters, curing and pickling any kind of fish, and the Danish gourmet kitchen. Working in a ship’s galley as a young merchant marine, he sailed the very waters of Northern Europe and the Baltic and learned all the aspects of this regions’ best foods…the same areas and tastes that you’ll visit and learn about as you travel with him on this unique itinerary. When you think of Russia, land of the Czars, you naturally think of Vodka, so Chef Per’s onboard “Vodka and Caviar Experience” is your opportunity to learn the best way to enjoy this historic Russian pairing. He’ll be using Premium Vodkas and Caviars that you simply must be aware of. 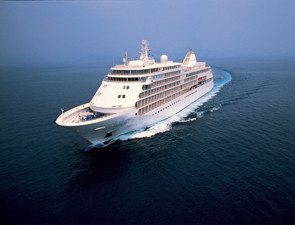 This is a Silversea complimentary event, exclusive to this group. If you’d like to learn more about this cruise and Chef Per Jacobsen, please click here. 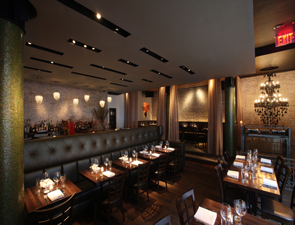 If you’d like to book a reservation, please click here. Leave it to Las Vegas to launch a sophisticated alternative to the traditional wine tasting. TravelsinTaste.com has uncovered a unique happy hour for you. Happy Hour isn’t just limited to beer and booze anymore, There’s a new twist that’s taking over the nation: adult ice cream. It’s premium ice cream blended with real wine, not flavoring. 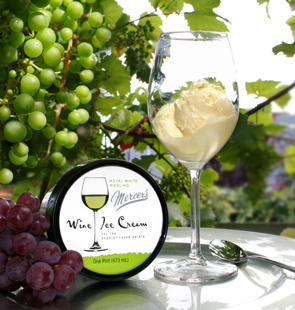 Double Helix Wine Bar and Boutique, which is always ahead of the curve with all things wine, will hold an ice cream party for adults on March 26 at its location in the Palazzo Resort & Casino to introduce Mercer’s award-winning wine ice cream to the Las Vegas Strip. With flavors like red raspberry chardonnay and chocolate cabernet, there’s something for everyone. The menu also includes cherry merlot, peach white zinfandel and royal white riesling in addition to some of the 50 wines by the glass that Double Helix serves. Don’t forget to try some of Emeril’s creations from Table 10, also served at Double Helix! Read more about this in our story on TheStreet.com!